Sparket Corporate Gifts for pleasant surprises makes it easy for you to select the various golf related products from the below shortlisted product categories. Products made out of wood, metal with gold and silver polish with good branding space to ensure high visibility for you and your company for long time. Please check below the images and select the various trophies or mementoes related with gold tournaments. However, if you need more choices or latest addition then please feel free to ask us for our latest additions to the golf series. Depending on your budget and quantities we can even design and customise the trophies or mementoes to make the event more memorable. Ideal gift to associate with the game of golf by giving golf clubs as table top stationeries. When you need utility of clock along with the golf sports and further branding of your logo then you can select from the range given below. You can even imprint your logo on the dial of the clock. All the clocks are with Japanese movement with warranty of 18 months in gold and silver finish. For senior executives you can pick from the various choices given below with more space for daily utility items and always in front of the eyes on the desk of your target audience. Check the choice of miniature golf club bags along with accessories to impress the recipient and connect with the golf sport. You can select the handy key ring with clock and the choice of hooks to make it easy for the people to carry it round. This is the ideal giveaway gift at any golf event with visiting card holder and a keychain to not only symbolise with the game with your branding but also to ensure mileage once the event is over. 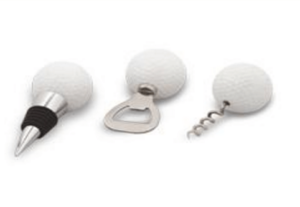 People would love to own the bar opener set associated with game of golf so you can consider distributing the same with your logo branding for higher recall of your brand. We also have imported golf items available from time to time like personalised foldable golf kit for use at office and home. Please do write to us for the latest additions in the golf gifts range as we keep adding new products every now and then.